The American Kings will headline the First Friday event on July 6th in downtown Greenville. Greenville, OH -Main Street Greenville will once again be bringing back Memories on Main for July’s First Friday event. The focus is a 1950’s inspired theme, highlighting memories that once took place on Broadway, the main drag of downtown Greenville. Fire up the engine of your hot rod and take a cruise down memory lane on Friday, July 6th from 6 to 9 pm. The festivities will include music by The American Kings, a ping-pong ball drop, 50’s themed workouts and sock hop, and fun family activities and giveaways hosted by Second National Bank in honor of their 135th anniversary. 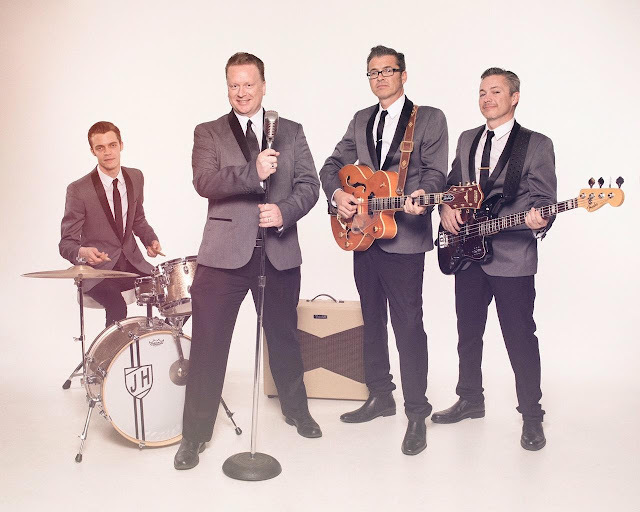 The American Kings will perform from 7 to 9 pm on 5th Street between the Coffee Pot and Michael’s Fine Clocks and Jewelry. They are a Dayton band who still allow the words “sock” and “hop” to make perfect sense together. With their true renditions of your favorite rock ‘n’ roll songs, you can fully trust a high-energy and fun show. The ping-pong ball drop, sponsored by Greenville National Bank and Second National Bank, will take place on West 3rd Street at 9:10 pm sharp. Main Street Greenville will be dropping 200 ping-pong balls from the ladder of a fire truck. The ping-pong balls will have colored dots on them, each color representing a different prize level. F45 Training and Refit will be showcasing 50’s themed workouts also on West 3rd street. They will be strapping on their gym shoes for programs at 7, 7:30, 8, and 8:30 pm. In between workouts there will be plenty of 50’s music and dancing! Are your children into lights and sirens? The Greenville Fire Department will have a firetruck stationed on West 3rd Street at 8:30 pm before the ping-pong ball drop. Bring your kids out to take pictures with the truck and meet a couple of local firefighters! Second National Bank wants to celebrate their 135th anniversary with the community! During the festivities they will be providing games, food, prizes, and music to recognize their many years of dedication to our town and hopefully many more to come. In addition to all the activities listed above, many downtown businesses will be open late for all to enjoy, so make reservations for dinner and explore the shopping experiences offered!